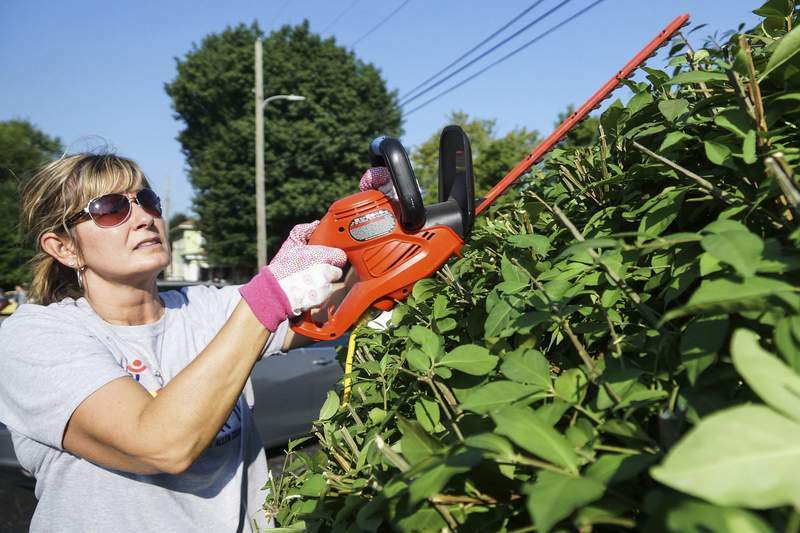 Mike Moore | The Journal Gazette Michelle Schlotterback, a 3Rivers Federal Credit Union volunteer, trims bushes at the Wellspring Interfaith Social Services building as part of the United Way Day of Caring program on Wednesday. People cared back in 1992. There just weren't as many of them involved. United Way of Allen County's first Day of Caring 26 years ago drew about 250 volunteers and focused on one project – fixing up what was then the YWCA campus on North Wells Street. Last year, more than 1,600 people took part in more than 60 projects around the community. With an assist from one of the summer's most pleasant days, this year's effort shattered last year's record. More than 1,800 people devoted part or all of Wednesday to more than 80 projects, including painting, landscaping, putting together playgrounds, tree trimming and eliminating poison ivy, according to David Nicole, United Way's president and CEO. Most of the day's volunteers sign up through businesses or nonprofit organizations, Nicole said. Suggestions for the day's work are vetted by volunteers from organized labor with project-management experience. They determine how many people a project requires, the materials needed and whether the work is doable in a day, Nicole said. “Some projects are too broad,” he said. In those cases, the day's organizers help pare them down and suggest other ways to get the rest of the work done. After all, Nicole said, there's no reason individuals in our community can't pitch in with the same kind of help on whatever day they choose. “The Day of Caring is an entry point for community engagement,” Nicole said. Some of those who participate and see the result “are, like, 'How do I do this more?' ” he said. Nonprofits that receive help may also have the chance to recruit supporters. For instance, Nicole said, when more than 30 volunteers from Vera Bradley redid a room at Big Brothers Big Sisters of Northeast Indiana, they also got to learn firsthand about the organization's mission and needs. Not into painting walls or trimming trees? Maybe next year you could join the group from Women United who scheduled their lunch hour to put together literacy kits to help parents who want to get their children excited about reading. Their task involved filling bags with a soft-covered version of the classic tale “The Old Woman Who Swallowed a Fly”; a Velcro-clad puppet of the protagonist; and Velcro-backed versions of the fly, spider, frog, cat and other creatures the ill-fated old woman swallows. The idea is to increase reading engagement; as the parent reads the story, the child sticks the appropriate animal likeness to the old woman's coat. Doesn't that sound like a pleasant way to spend a bit of a nice August day?